I've always wondered what it feels like to fly down a slope going mach-10 on a pair of skis, and I'd be tempted to try it if the threat of death wasn't so impending. Thankfully, we mentioned Ski Challenge 12 in our latest new-game roundup and I can finally experience the exhilarating rush of downhill skiing from the comfort of my home. 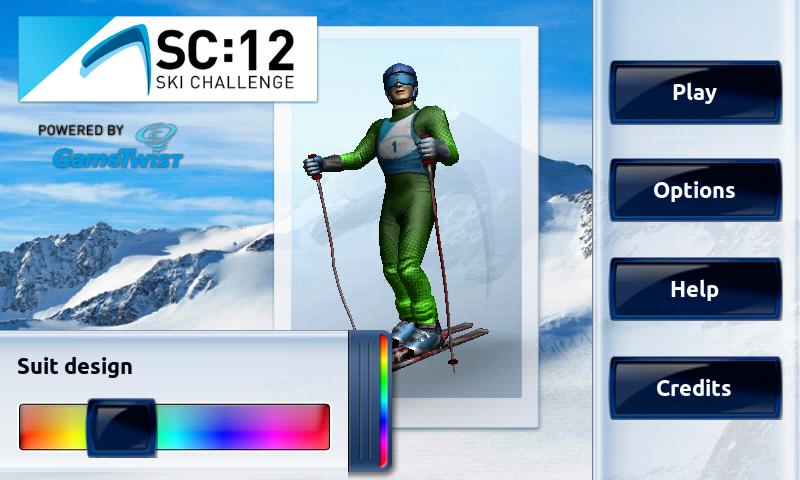 Ski Challenge 12 is a unique racing game in which you play as a professional Alpine skier. What makes this game interesting is the fact that you can qualify for and participate in real tournaments, which is a nice approach to livening up an in-game leader board. Each course location has a predetermined tournament period and once a course is completed with a time that qualifies, you're in. Each tournament lasts two days, during which you can do practice runs and finally go for the best time to see how you stack up against the rest of the skiing world. In addition to that hoopla, this game sports some pretty nice graphics and exciting gameplay. While there is only one goal to this game and it is quite simple (ie. make it down the slope as fast as possible), you'll still be able to experience some variation. 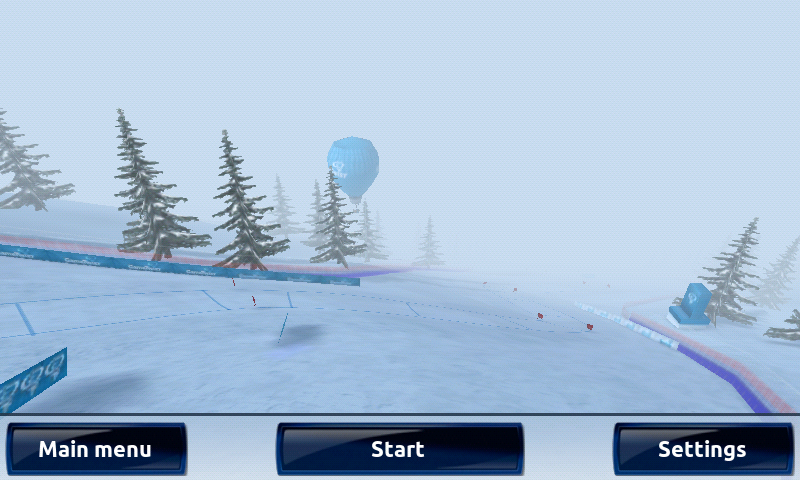 There are six different courses, three different weather settings, and three different race types. Each course provides a fresh challenge, while the weather settings change the course conditions, making the skier react differently on his decent. Training - Here you can test out the course, try different weather conditions, and master the slope before hitting up the qualifier. Qualifier - This is where hard training is put to the test. Make the qualifying time and you'll be entered into the tournament. There are also global leader boards here for qualifying times, so sizing up competition is simple. Tournament - After training and qualifying, it's time for the big show. The tournament happens during a preset, two-day time frame in which those who qualified can race. Complete the course as fast as possible and see if you can come out on top. Although I wish there were more race types, it's still easy to casually pick up and start a training time trial. I've also found myself patiently anticipating the next tournament, and trying to better my qualifying time in the meantime. The control scheme is set to accelerometer with automatic acceleration by default, but there are a few more options that may suite your playing style better. 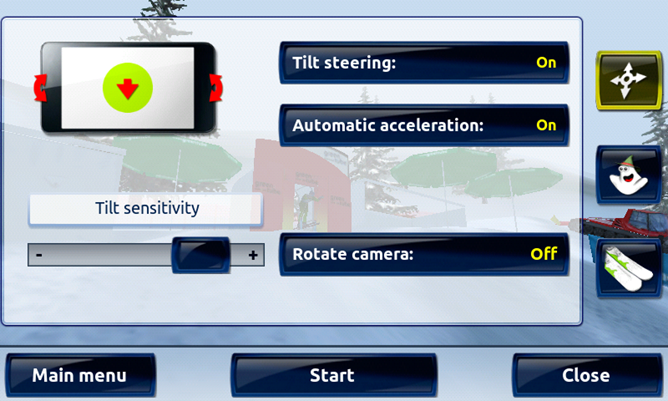 You can opt in for touch controls and also set automatic acceleration to off. 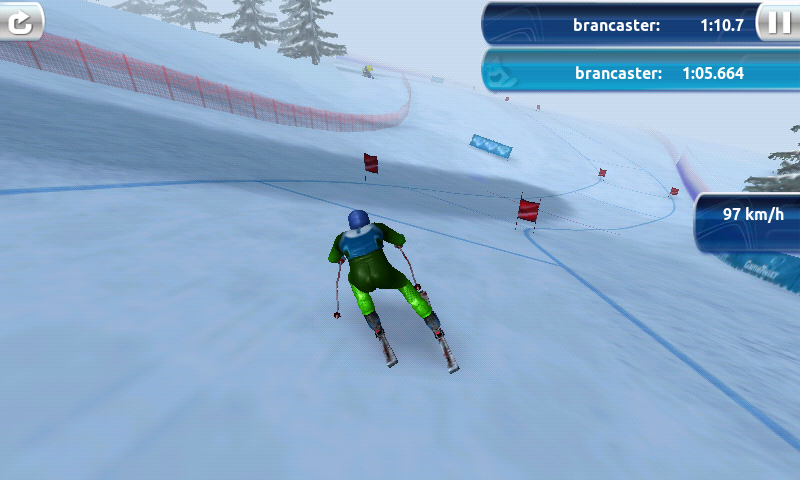 In my experience, I was able to achieve higher speeds with the accelerometer on and auto-acceleration off, this way I could better control how my skier took turns. In addition, you can find a balance between speed and carve (handling) that will allow you to achieve the best time possible. Even more interesting, once you find a balance for one course, it isn't going to be the optimal setting for the next. 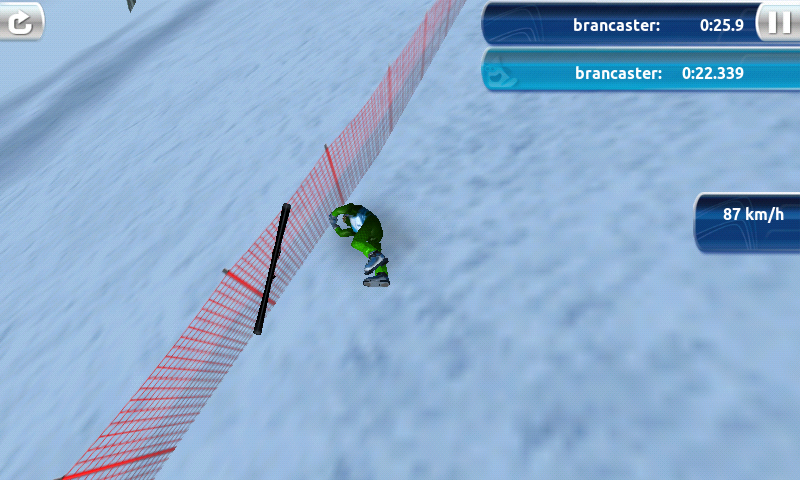 This game forces the player to think like a skier, and I like that. 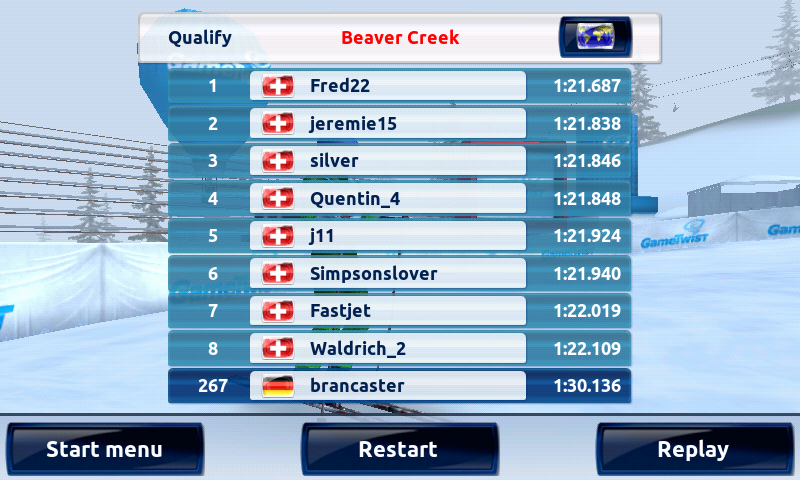 Overall, Ski Challenge 12 is pretty solid. It's well-made, has some pretty excellent graphics, and has some nice gameplay. That being said, I would like to see some more options for race types. Trying to beat my best time while waiting around for the tournament is fun and all, but I think I'd get tired of doing the same thing after a while. 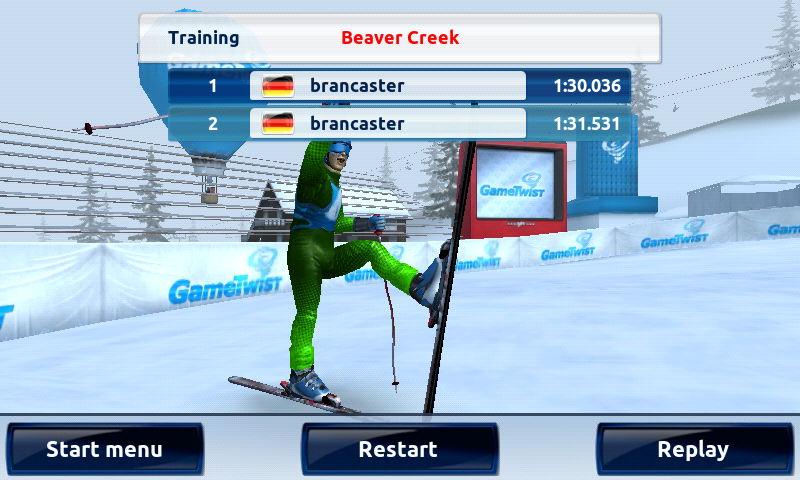 If you've ever dreamed of being a downhill skier, and I know you have, check out this game below. You can also try out the Lite version before you buy it.